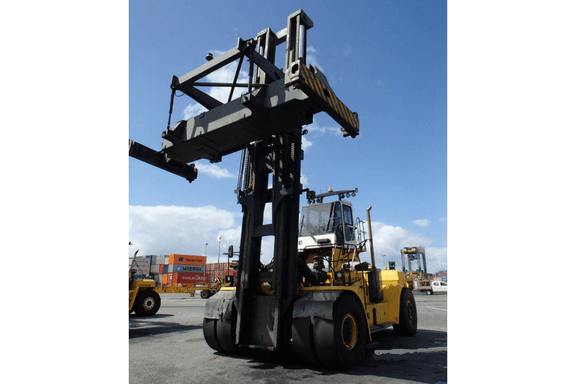 SMV container handlers offer both versatility and cost effective laden container handling. All masted container handlers’ benefit from the same strong Scandinavian values as the forklift equivalent and are supplied with a container spreader that can be hung in three separate ways:- Standard drop forks – thus allowing ultimate flexibility between fork handling and container handling Inverted forks – to offer container handling within a height restricted area. The SMV fork shaft system allows quick inter change between inverted forks and standard drop forks thus increasing versatility Gantry – By suspending below a dedicated gantry affords the most cost effective method of laden container handling.